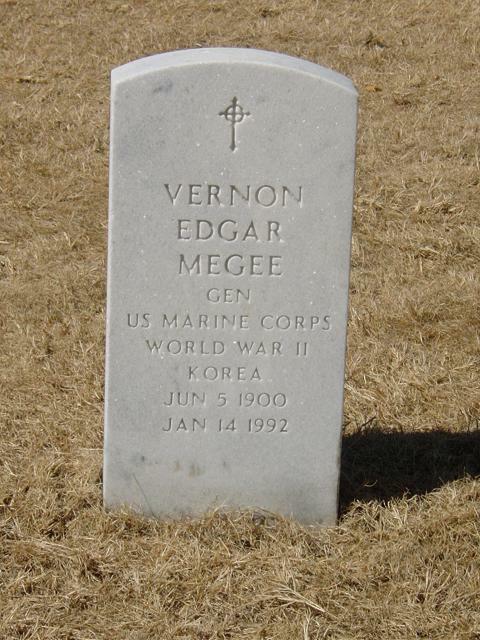 General Vernon E. Megee, aviator and combat veteran of World War II and Korea, who was a pioneer in the development of close air support for ground combat operations, died 14 January 1992 in Albuquerque, New Mexico at the age of 91. During the Korean Conflict, the general commanded the 1st Marine Aircraft Wing from January to December 1953, receiving the Air Force Distinguished Service Medal in that capacity. As a Colonel during World War II, General Megee saw action in the Iwo Jima, Okinawa and Western Carolines operations. He earned the Legion of Merit with Combat "V" as commander of Landing Force Air Support Control Unit One at Iwo Jima, and the Bronze Star Medal with Combat "V" as commander of all the Marine landing force air support control units at Okinawa. On 19 June 1930, the General, then a First Lieutenant, earned the Navy and Marine Corps Medal for commendatory achievement while flying as an observer and machine gunner in an attack on a large force of rebel bandits in Nicaragua. General Megee was born 5 January 1900, in Tulsa, Oklahoma, and is a graduate of Oklahoma A&M College. He enlisted in the Marine Corps 8 March 1919, and was commissioned a Second Lieutenant 4 May 1922. After completing the Officers Basic Course, he served first tour of expeditionary duty with the 1st Marine Brigade in Haiti, from October 1923 to November 1925. He was then stationed with the 10th Marines at Quantico, Virginia. He was promoted to First Lieutenant in March 1926. In April of the following year, Lieutenant Megee was ordered to China for his second tour of expeditionary duty. Returning from China in March 1928, he was assigned to preliminary aviation training at the Naval Air Station, San Diego, California, until January 1929. He then began another tour of expeditionary service as Squadrons Quartermaster, Aircraft Squadrons, 2d Marine Brigade, in Nicaragua. After earning the Navy and Marine Corps Medal there, he returned to the United States to enter flight training at Pensacola, Florida, in January 1931. Awarded his wings in February 1932, Lieutenant Megee was next assigned to Aircraft Squadrons, West Coast Expeditionary Forces at San Diego, where he remained until May 1933. The following month he began a three-year tour of duty at Quantico as a student and instructor in the Marine Corps Schools, then as Executive Officer of Marine Fighter Squadron 9. He was promoted to captain in November 1934. Captain Megee entered the Air Corps Tactical School at Maxwell Field, Alabama, in August 1936. After graduating in June 1937, he returned to Quantico for another two years as an instructor in aviation tactics. He was promoted to major in August 1938. In July 1939, the major took command of Marine Fighter Squadron 2, 2d Marine Aircraft Group, with which he participated in fleet exercises the following year. In October 1940, Major Megee was assigned to the U.S. Naval Aviation Mission to Peru as special advisor to that government's Minister of Aviation. For his service in that capacity during the next three years, he was awarded the Peruvian Aviation Cross, First Class. He was promoted to Lieutenant Colonel in January 1942, and to Colonel in December 1942. He returned to the United States in October 1943. The following month Colonel Megee reported to Cherry Point, North Carolina, as Chief of Staff of the 3d Marine Aircraft Wing. He went overseas with that unit in May 1944. Assigned to Aircraft, Fleet Marine Force, Pacific, in October 1944, he was named commander of the Provisional Air Support Command. After leading Control Unit One at Iwo Jima, he became Chief of Staff, Air Support Control Units, Pacific Fleet, with additional duty as Commander, Marine Air Support Control Units. He served in that capacity until he returned to the United States in September 1945. Reporting to Marine Corps Headquarters that October, Colonel Megee was a member of the Joint Amphibious Operations and Doctrines Committee until August 1946. He then served briefly as an instructor at the National War College, Washington, D.C. He was promoted to Brigadier General in December 1946. Ordered to Norfolk, Virginia, the General became Chief of Staff, Fleet Marine Force, Atlantic, the following month. General Megee returned to Washington in August 1949 to serve as Assistant Director of Marine Corps Aviation until January 1950. That month he joined the Joint Staff, Department of Defense. In August 1951, he was promoted to Major General and named commander of the Marine Corps Air Station and Marine Corps Air Bases, Cherry Point, North Carolina. The General remained there until February 1952, then served for almost a year as Commanding General, Aircraft, Fleet Marine Force, Pacific, at El Toro, California. He took command of the 1st Marine Aircraft Wing in Korea in January 1953. The following January, he reported to Pearl Harbor, where he served as Deputy Commander, Fleet Marine Force, Pacific, until June 1955. A month later he was appointed Commanding General, Aircraft, Fleet Marine Force, Atlantic, serving in that capacity at Norfolk, until December 1955. General Megee was promoted to Lieutenant General 1 January 1956. On the same date, he was appointed Assistant Commandant of the Marine Corps and Chief of Staff, Headquarters Marine Corps. He was the first Marine aviator to serve in that capacity. Following two years in this assignment, he moved to Honolulu, where he served as Commanding General, Fleet Marine Force, Pacific, from December 1957 until his retirement 1 November 1959. He was advanced to the rank of General upon retirement by reason of having been specially commended in combat. the Korean Presidential Unit Citation, and the Philippine Liberation Ribbon. The General was buried with full military honors in Section 2, Grave 4950, Arlington National Cemetery.